The lovable, gentle and cuddly Bloodhound makes a fantastic family pet, as long as you don’t mind a healthy dose of slobber. It is not surprising to lean that these noble dogs were created by monks in St Hubert in Belgium as part of a process stretching over several centuries. Since then, several other breeds have been introduced into the lineage, which has led to the modern black and tan Bloodhound we know today. 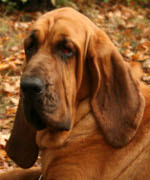 Bloodhounds have an extraordinary sense of smell, which makes them unrivalled trackers. So much so that the first time evidence from a sniffing dog was admissive in court, it was provided by a Bloodhound. The down side of this is that they must be kept on a leash when out, as they can catch trails up to 12 days old and, if they do, they will go off in pursuit of it, and are near impossible to stop. The bloodhound had always been extremely popular in popular culture, with notable examples including Trusty from The Lady and the Tramp, Ladybird from King of the Hill, Lightning in Racing Stripes, Bruno in Cindarella and of course McGruff the Crime Dog. These are relatively healthy dogs, but can be prone to bloat, cherry eye, entropion, hip dysplasia and ear infections. They are not suitable for small living spaces – they love to be outside, where they can exercise both their body and that exceptional sense of smell. This means they need regular bathing, especially their ears which, as they are so long, tend to get very dirty. By joining this group, you club together with other Bloodhound owners to get a great deal for your big, lovable canine detective.